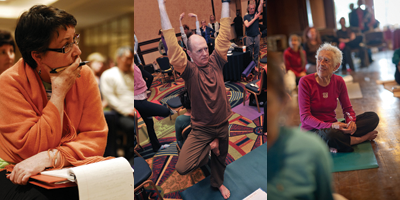 SYTAR is dedicated entirely to professional education, research, practice, and policy issues for yoga therapy. Educational Standards for the Training of Yoga Therapists. Fifteen-minute talks modeled on “Ted Talks” at the start of the conference that will get people talking. See the Call for CIC Presentations. Developing community is an important part of SYTAR. To that end, several meals and get-togethers are provided, including a reception on Thursday night, a banquet on Saturday night, plus box lunches on Friday and Saturday to be enjoyed on the grounds along the Charles River. Paul Copeland, MA, DO. Healing Pathways Medical Clinic and Bo Forbes, Psy. D.
SYTAR is offered back-to-back with SYR (Symposium on Yoga Research) at the Boston Marriott Newton, June 13-16.